Salmon with Salsa Mayo Topping topped with fresh salsa and mayonnaise. Super moist and full of flavor, it’s a quick and easy weeknight dinner the whole family will fight over. 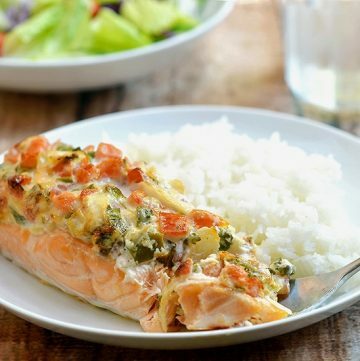 If you’re looking for a dinner meal that’s short on prep but packs big, awesome flavors, this baked salmon with mayonnaise and salsa topping won’t disappoint. It requires minimum effort and very little tending yet tastes like you sweated in the kitchen for hours. The secret to the super moist and flavorful salmon? Mayonnaise! The fresh pico de gallo salsa and mayonnaise topping provides another layer of flavor and texture and also acts as a protective coating that keeps the fish from drying out during the cooking process. Make sure to deseed the tomatoes as you don’t want the salsa to be too liquidy. Prepare the salsa and stir in the mayonnaise just when you’re ready to top the fish and bake as the topping tends to water down over time and will slide off the fish. If you want a bit more tang and fewer calories, substitute plain yogurt for the mayonnaise. Looking for more salmon recipes? 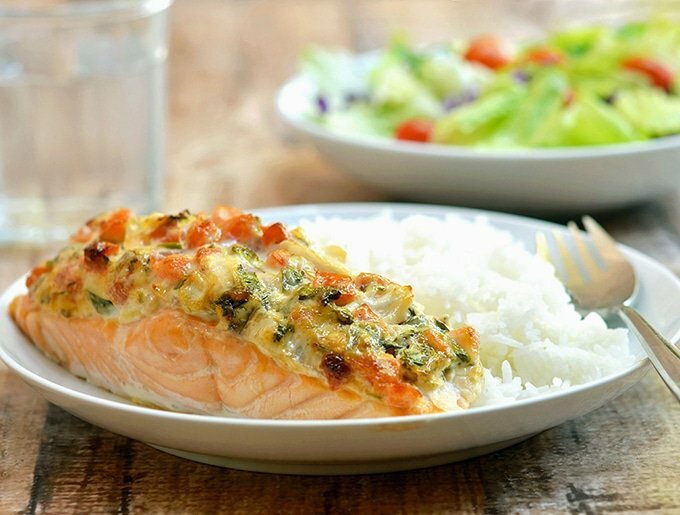 This sweet chili salmon with garlicky spinach is sure to be a dinner hit! Salmon with Salsa Mayo Topping topped with fresh salsa and mayonnaise. Super moist and full of flavor, it's a quick and easy weeknight dinner the whole family will fight over. Pat salmon dry. Season with salt and pepper to taste. 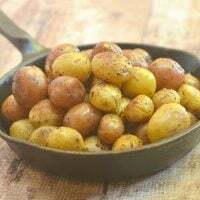 Arrange in a single layer on an ungreased baking sheet. In a bowl, combine tomatoes, onions, cilantro, jalapeno and lime juice. Season with salt and pepper to taste. Drain well. Add mayonnaise and stir to combine. Spoon mixture over salmon and spread to coat the top of fish thoroughly. 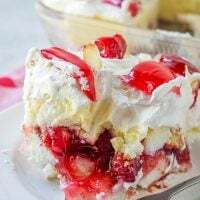 In a 400 F oven, bake for about 10 to 15 minutes or until topping is lightly browned and flesh easily flakes with a fork. We love salmon and I am always looking for new ways to make it! This looks so good, thanks for sharing! Thanks, Chelsea! 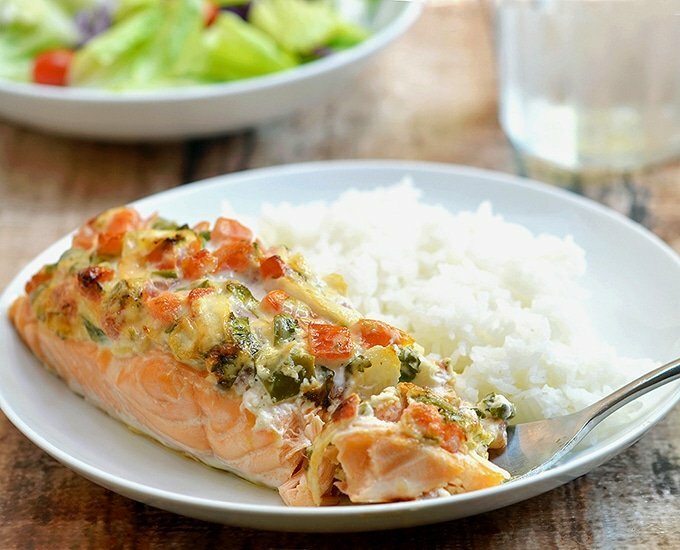 I hope you give it a try, the mayo topping really makes the salmon super moist and flavorful. I wonder if tilapia would work? This looks like an amazing meal to make. My husband would enjoy this. 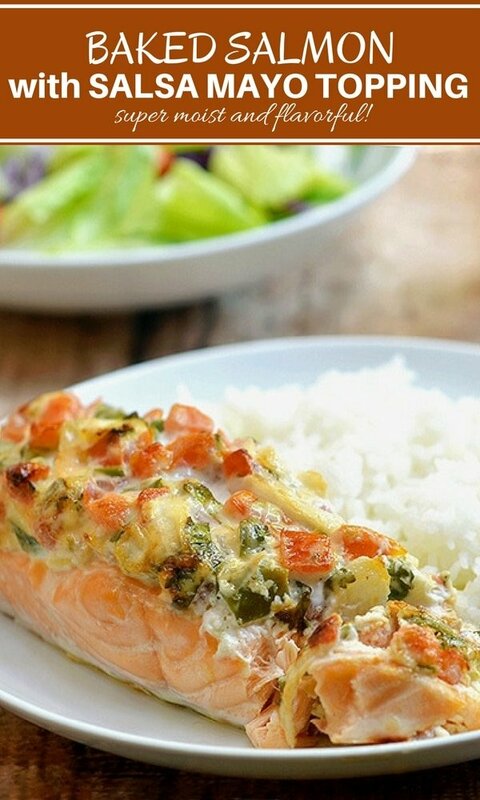 I’ve never had salmon but this looks amazing. I am pinning it for later 🙂 Thanks for sharing! This looks so good! 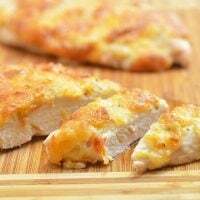 I have tried baking a similar recipe with dory and I think this is much better! My hubby loves salmon. I will have to make this for him. It looks delicious. This would be perfect for a weeknight. I have to pencil it in. Thank you for the suggestion. I love Salmon, it’s a versatile ingredient and the more simple the recipe, the better it tastes! I love how easy this dish is to make. I’m definitely keeping the recipe. Now this looks simply delicious!! I am going to have to make this for dinner ASAP! Nice recipe, but I will try it with some minor changes as I am a vegetarian and can’t have salmon. I would use Tofu instead and enjoy this tasty recipe. I am not a fish eater but that sounds absolutely delish! We LOVE salmon! Thank you for a new way to serve it because honestly I was running out of ideas! This looks seriously amazing! I’m a big salmon fan but always trying to find ways to jazz it up a little! This will be on the menu this week for sure! 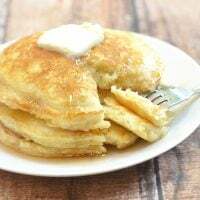 I just made this and it was a huge hit even with my 3 kiddos ages 8, 4, and 2! I must confess though, I had some FRESH salsa from the grocery store instead of making some…I didn’t have the jalapenos. It really doesn’t get much easier. I will definitely be making this again! Thank you! Thanks so much for trying the recipe and I am so glad you liked it.